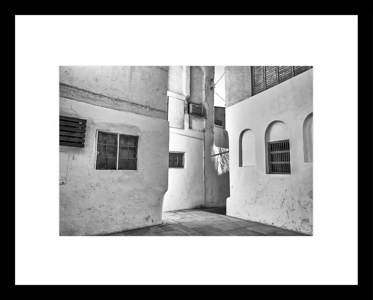 For customers based in Bahrain, I can offer excellent prices for high-quality images as prints, postcards and greetings cards. If you prefer to customise your order for larger quantities or different options than those displayed here, simply contact me via the link above. Delivery to anywhere in Bahrain is free for orders of BD30 or more. Lambda prints on Kodak Professional Endura paper in simple black frames with a classic white mount are superb value for money for the quality they offer. For archive quality prints that will last over 100 years, choose the exceptional fine art printing process of professional quality giclée printing on Hahnemühle Photo Rag 308 gsm paper. These are finished in a black frame with a classic white mount. Customised sizing, mounting and framing is available on request. Please use the order form below to place your order. 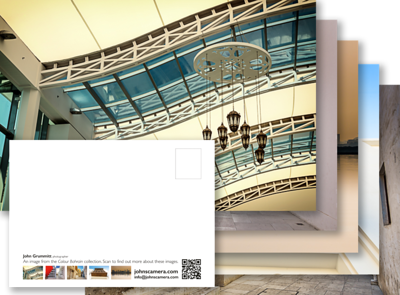 Each Bahrain collection is available as five-high quality A6-sized postcards. This consist of with five different images on 350gsm / 16pt card which is sourced from sustainable forests and is Elemental Chlorine Free (ECF). 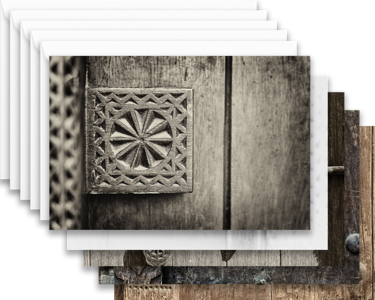 Each postcard has a matte finish on the image side, giving it a professional, high quality feel. The reverse is not laminated, so you can write on it. Please use the order form below to place your order. The Bahrain collections are also available as sets of five-high quality A6-sized greetings cards. The set contains five different images on 350gsm / 16pt card which is sourced from sustainable forests and is Elemental Chlorine Free (ECF). Each greetings card has a matte finish on the image side, giving it a professional, high quality feel. The inside is blank for your own message, and five white envelopes are included. Use this form to order prints on John's Camera. To find out the names of the prints you want, click to open John's Camera Portfolio in a new window. You can then click on any image to find its title. Unless otherwise indicated in the optional customisation field below, images will be matte printed A3 size and framed with black wood on white mounting board. Your order will qualify for free delivery anywhere in Bahrain. Use this form to order sets of postcards. To be sure of the collection title click to view the John's Camera Collections in a new window. If you'd like more than two different sets, simply submit this form more than once with your selections. Remember, orders of BD10 or more qualify for free delivery anywhere in Bahrain. Use this form to order sets of greetings cards. To be sure of the collection title, click to view the John's Camera Collections in a new window.